ANDERSON, John Bayard, a Representative from Illinois; born in Rockford, Winnebago County, Ill., February 15, 1922; graduated from Rockford High School, Rockford, Ill., 1939; A.B., University of Illinois, Urbana, Ill., 1942; J.D. University of Illinois, Urbana, Ill., 1946; LL.M., Harvard University Law School, Cambridge, Mass., 1949; faculty, Northeastern University School of Law, Boston, Mass., while attending Harvard; United States Army, World War II, 1943-1945; admitted to the Illinois bar in 1946; lawyer, private practice; adviser on the staff of the United States High Commissioner for Germany, 1952-1955; Illinois state's attorney of Winnebago County, Ill., 1956-1960; political author; elected as a Republican to the Eighty-seventh Congress and to the nine succeeding Congresses (January 3, 1961-January 3, 1981); chairman, Republican Conference, January 1969; was not a candidate for renomination to the Ninety-seventh Congress in 1980; unsuccessful independent candidate for President of the United States in 1980; visiting professor, Stanford University, 1981, University of Illinois College of Law, 1981, Brandeis University, 1985, Bryn Mawr College, 1985, Oregon State University, 1986, University of Massachusetts, 1986, and Nova University, 1987; died on December 3, 2017, in Washington, DC. Papers: 1960-1980, 439 cubic feet. The collection of John Bayard Anderson contains personal and congressional papers and correspondence, photographs, motion picture film, video tape, and sound recordings; includes Watergate material. A finding aid is available in the repository. Restricted. Papers: In the James Dunlap Nowlan Papers, 1971-1985, 5 linear feet. Includes documents from when James Nowlan was the organizer of John B. Anderson's 1980 presidential campaign. Papers: In the Catherine East Papers, 1960-1989, 50 linear feet. Includes correspondence, speeches, and other papers regarding Catherine East's role in the presidential campaign of John Anderson. The papers are closed until 2003 for processing. Videocassettes: 73 commercials, 1980. The commercials were used during John Anderson's campaigns from the 1980 presidential primary, Republican Party, presidential election, and the National Unity Party. The collection includes a debate between John Anderson and Ronald Reagan, as well as John Anderson's concession speech. Papers: In the Sam Wolgemuth Papers, 1962-1981, 5.25 cubic feet. Prominent people featured include John Anderson. A finding aid is available in the repository reading room. Papers: In the Eugene R. Bertermann Papers, 1955-1981, 18 cubic feet. Persons featured include John Anderson. A finding aid is available in the repository reading room. Anderson, John B. The American Economy We Need--and Won't Get from the Republicans or the Democrats. New York: Atheneum, 1984. ___. "American Protestantism and Political Ideology." In Congress and Conscience, edited by John B. Anderson, pp. 153-82. New York: Lippincott, 1970. ___. A Congressman's Choice: Between Two Worlds. 1970. Reprint, Grand Rapids, Mich.: Zondervan Publishing House, 1972. ___. "Essential Ingredients of Future Policy." In Republican Papers, edited by Melvin R. Laird, pp. 391-404. New York: Praeger, 1968. ___. A Proper Institution: Guaranteeing Televised Presidential Debates. New York: Priority Press Publications, 1988. ___. "Science Policy and Congress." In We Propose: A Modern Congress, edited by Mary McInnis, pp. 73-81. New York: McGraw-Hill, 1966. ___. Vision and Betrayal in America. Waco, Tex. : Word Books, 1975. ___., ed. Congress and Conscience. Philadelphia: J.P. Lippincott, 1970. Bisnow, Mark. Diary of a Dark Horse: The 1980 Anderson Presidential Campaign. Foreword by Tom Wicker. Carbondale: Southern Illinois University Press, 1983. A Campaign of Ideas: The 1980 Anderson/Lucey Platform. Compiled by Clifford W. Brown, Jr. and Robert J. Walker. Westport, Conn.: Greenwood Press, 1984. Golubovskis, George M. Crazy Dreaming--The Anderson Campaign 1980. Flint, Mich.: Talking Seal Press, 1981. Kotche, James R. John B. Anderson, Congressman & Presidential Candidate. Rockford, Ill.: J. Kotche, 1981. Party coalitions in the 1980s. Seymour Martin Lipset, editor; [contributors] John B. Anderson ... [et al.]. San Francisco, Calif.: Institute for Contemporary Studies, 1981. Ralph Nader Congress Project. 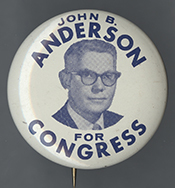 Citizens Look at Congress: John B. Anderson, Republican Representative from Illinois. Washington, D. C.: Grossman Publishers, 1972.